Since the discovery of the Roentgen ray a precise and accurate assessment of bone mineral content has been a challenge to many investigators. A number of methods have been developed but no one satisfied. Considering its technical possibilities computed tomography is very promising in determination of BMC. The new modality enables BMC estimations in the axial skeletal trabecular bone. 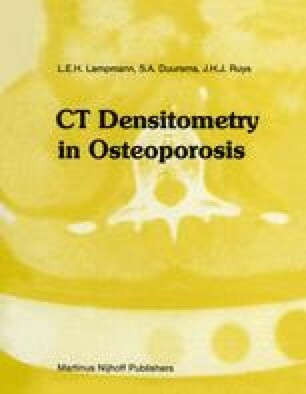 CT densitometry can be performed on a normal commercially available third generation whole body CT scanner. No dedicated device in a special clinical set-up is necessary.